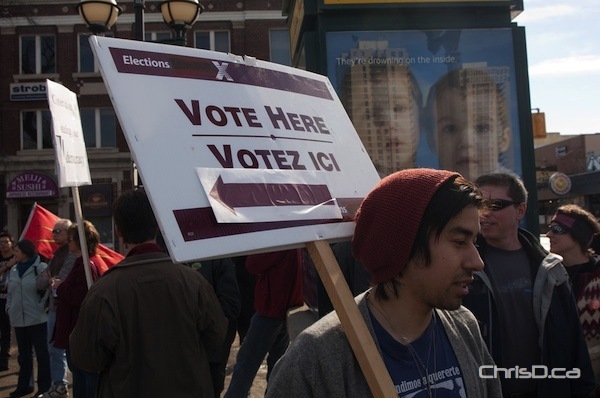 A group of about 100 voters, upset over the robocall scandal currently plaguing Canada’s political scene, made their voices heard during a protest on Sunday. The peaceful Winnipeg protest, which had the support of similar movements across Canada, called for a public inquiry into the fraud scandal. The protest began at River Avenue and Osborne Street and made its way to the constituency office of MP Joyce Bateman on Corydon Avenue. Elections Canada is currently investigating some 31,000 reports from 57 ridings of robocalls during the election, in which voters were falsely told that their polling station had been moved to another location. Speakers included Winnipeg North MP Kevin Lamoureux, and former MP and MLA Judy Wasylycia-Leis.